At almost every conference that I attend I offer a session about Google Maps and Google Earth. Most of the people that come to those sessions are social studies teachers. That is because there is a natural connection between maps and topics in social studies. But there are plenty of other subject areas and topics in which Google Maps and Google Earth can be helpful. One example of this comes from my former colleague, John Haley. John Haley created a blog and a corresponding Google Map called Maine Geology Hikes. On Maine Geology Hikes John writes about interesting hikes in Maine that lead you to neat geological formations. Each placemark on the map includes a description with a link back to a blog post about the hike. The blog posts are more than just stories about hiking. He shares lessons worthy of inclusion in books on the topic of Maine geology. 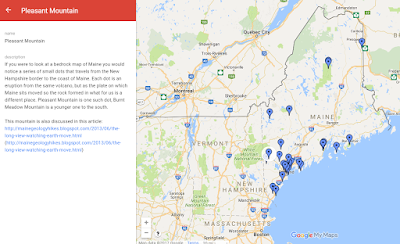 John Haley's Maine Geology Hikes is a great example of using Google Maps in an subject area outside of social studies. The model that John provides could be modified for any state or region. Google's My Maps tool offers a couple of ways that your students can collaborate to create their own geology hikes maps.